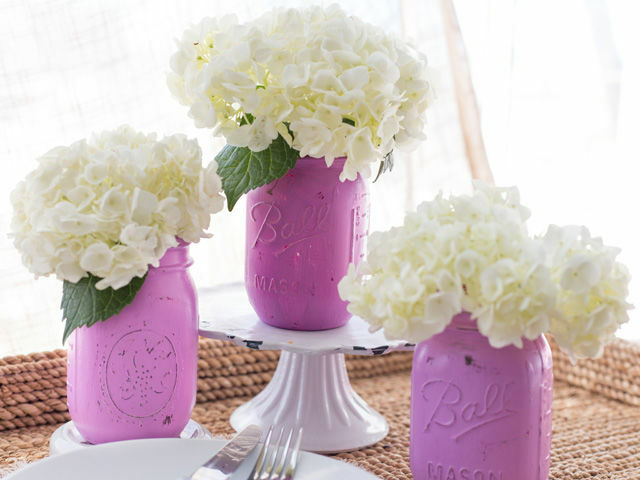 Did you know you can hand paint your old used mason jars to make beautiful centerpieces? They constitute an excellent albeit cheap décor item for weddings, bridal showers, baby showers, Christmas parties, etc. I was motivated by a tutorial on DARBY SMART to make these darlings for my son’s first birthday. They flaunt a distressed ombre look that oozes a rustic charm. Add a generous amount of the purple yam paint to 3 hollows of the palette. Top that off with a little amount of a pink shade and mix nicely with the paint brush. 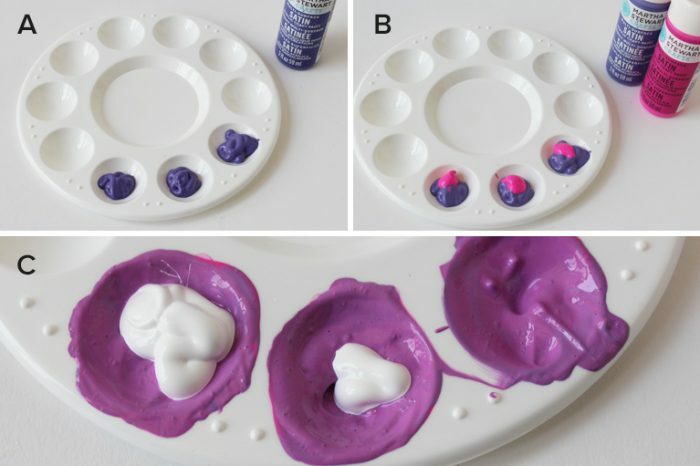 Then add white paint to just two of the containers and mix well. 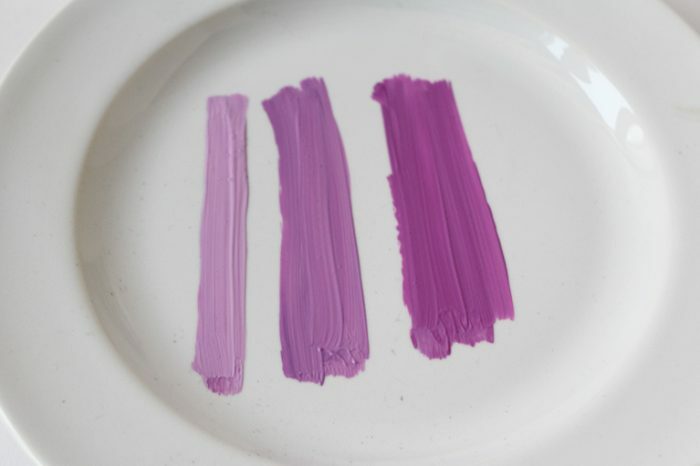 Ensure that you put more of the white paint in one than the other so that there is a nice variation among the purple shades after combining. To test the color gradient draw 3 parallel lines of the different colors with your paintbrush on any white surface. If you are not happy with what you see, add some more color wherever needed. 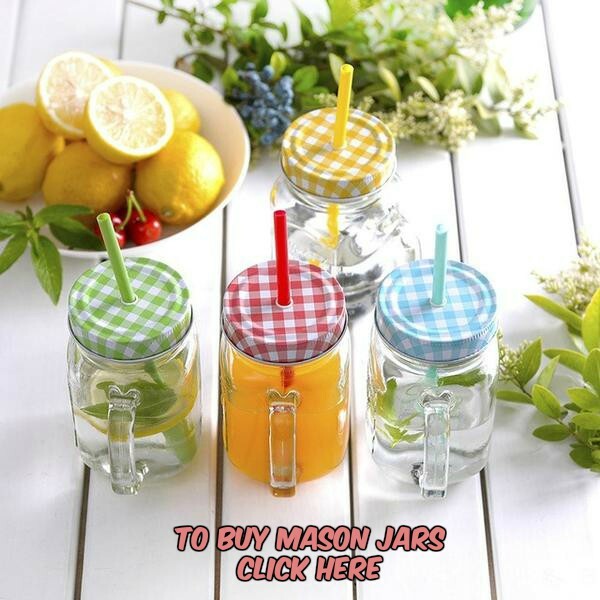 Once you achieve the perfect shades, apply a uniform coat of any one color on one of the mason jars. Always move the foam brush in one direction to accomplish this neatly. 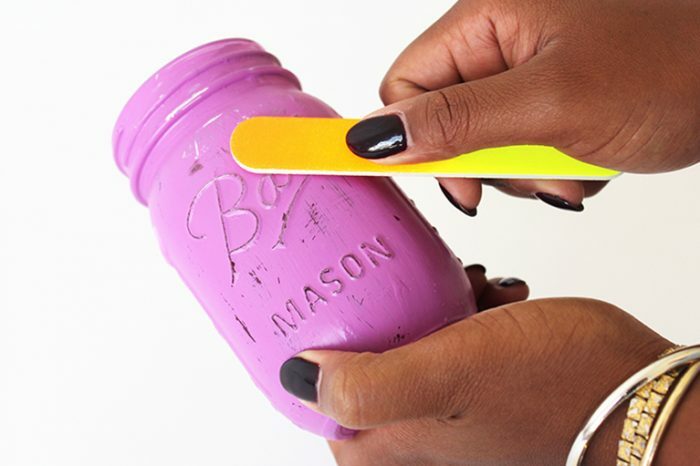 Rinse the brush and repeat with another color on the second mason jar. Wash the brush again before giving the third jar a coat of the final color that is left. 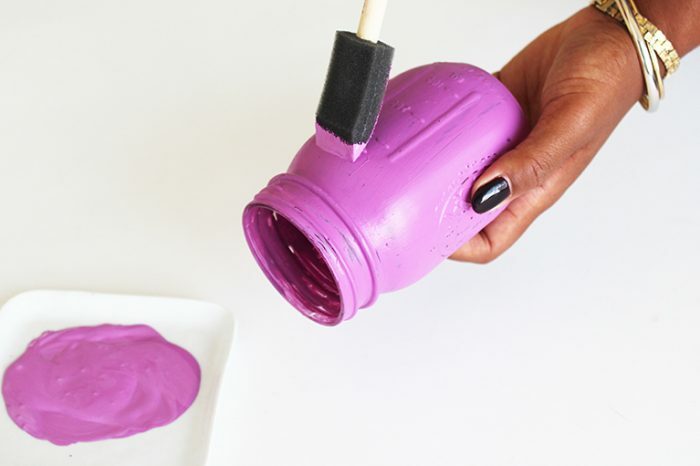 If you feel you need deeper shades, give each jar a second coat of paint. Sand lightly paying attention to the raised surfaces until the jars are left with a distressed look. Decorate with flowers and arrange them aesthetically at the center of the table for an eye-catching look. 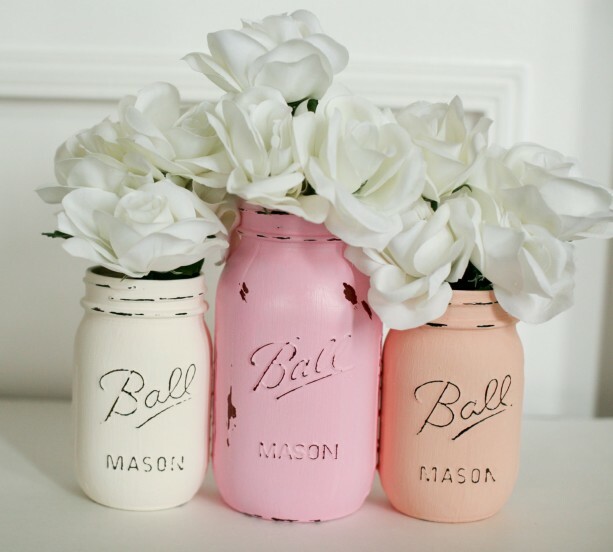 If you want, you can indulge in some creative spray painting to nail this adorable project. They look great as decorations for weddings. 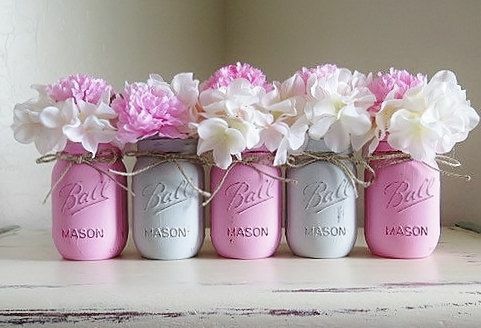 If you wish, you can tie a bow with a twine at the neck of the jars for a country look. It best to choose flowers that befit the season for a fresh look. 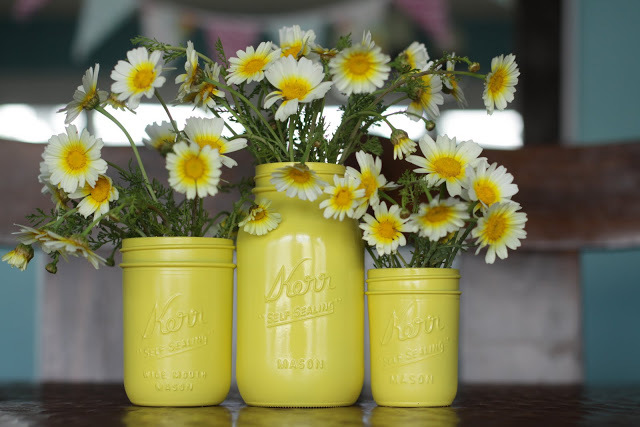 Choose blooms that suit the colors of your mason jars. You will surely be glad about how they turn out.